At Thursday’s preview gala for the Dallas Art Fair, two live human mannequins donning Roberto Cavalli gowns posed in the windows, greeting guests as they entered. It’s an appropriate introduction to an art fair in the retail luxury hub that is Dallas, Texas. The living clothes hangers came courtesy NorthPark Center, a gargantuan shopping mecca started by Raymond Nasher, the collector whose largess created the Nasher Sculpture Center in town and established Dallas’s dual-cylinder devotion to buying clothes and buying art. Gagosian was the big get this year, but a search for its stand went nowhere. Curiously, there was no signage where it was supposed to be. It turns out that the gallery eschewed its usual display of its blockbuster artists like Damien Hirst, or Jeff Koons, and instead bequeathed control of the booth to artist Piero Golia, who exhibited a Chalet, an interactive environment that was on view at the Nasher in 2015. “This space is a platform to combine relic, fiction, and reality to bring back a story of what was,” read the text on the wall outside of the booth, where canvases seemingly based on the Looney Tunes “That’s All Folks!” logo lined the walls. A gold model of Golio’s studio stood on a platform in the middle of the room. And then there was the artist, actually present in the booth, claiming that he himself took down the Gagosian signs. “Names on the door are worth less than what you find when you walk into the house, no?” Piero Golia said with a thick Italian accent. When asked if anything was for sale, he responded, “No. I’m sure if people want to buy, they will buy it one day.” The artist also claimed that the Gagosian team had already flown back to New York. “We’re thinking about the whole world, but we also want to pay attention to these communities that are doing serious work,” Maupin added. Lehmann Maupin’s booth carried work by Juergen Teller, who was feted last night for contributing photographs to the new Dallas hot spot Mirador in Forty Five Ten. An adorable photograph by Teller of a wet dog next to a vase of pink roses sold for between $18,500 and $24,800, while a portrait of writer Joan Didion went for between $31,000 and $43,000. Later on, a neon by Tracey Emin was purchased for between $74,300 and $86,700. And the gallery nailed the Dallas demographic with Catherine Opie’s “High School Football” series, from which pieces sold in the range of $35,000 to $45,000. Texas forever! It was unclear how many works were getting snapped up by institutions, but at least one museum was buying. 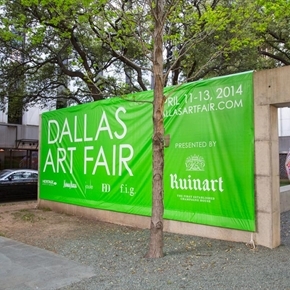 The Dallas Museum of Art, through the Dallas Art Fair Foundation Acquisition Program, added the following pieces to its collection: a sculptural painting by Justin Adian from Skarstedt, a painting by Katherine Bradford from Canada; a photographic work by Andrea Galvani from Eduardo Secci Gallery, an acrylic work by Summer Wheat from Fridman Gallery, a painting by Matthew Wong from Karma, and two works by Derek Fordjour from Luce Gallery. New York-based performance artist Jacolby Satterwhite had a dynamic display of works that ranged from a trippy wallpaper piece to a VR world at Lundgren Gallery from Palma, Spain. New York-based Chloe Wise had one of her portraits on display at Sébastien Bertrand, near a small white canvas by Ken Kagami with the sentence “Please imagine a boring abstract painting” written on it in red. Texas is, of course, a Republican stronghold, particularly oil-stained Dallas, and the political works that have dominated some recent fairs were not on offer, aside from a handful of exceptions, like the cheeky commentary at Carbon 12 from Swiss artist Olaf Breuning in the form of a $9,000 clay sculpture titled Scared of the Wall that showed five Trump-like figures facing a stone wall. At Sébastien Bertrand, Berlin duo Yarisal & Kublitz reflected on the current events in the United States with Just Starting Over Again, a depiction of an American flag hanging on a wall with its stars and stripes on the ground. Sales were robust from the beginning of the fair until the end of the night during the preview gala. Carbon 12 sold a moving sculpture by Sara Rahbar of a pair of bronze-cast hands and forearms hanging from chains in the first two hours, later on reporting sales of works by Heitor Cortesao and Philip Mueller. Marlborough Contemporary sold a painting of lilies by Ansel Krut, a Tony Matelli sculpture of a Budweiser can, pizza slices, and cards, and a wall piece by Greg Bogin. By the night’s close, the human models had gone home, and your usual headless mannequins took their place, still displaying the same Roberto Cavalli gowns.